...but don't you believe that either! reality and people go to war and kill one another on false perceptions. Everyone should learn the difference between opinions, suggestion and fact. Thanks for this discussion, Ming. 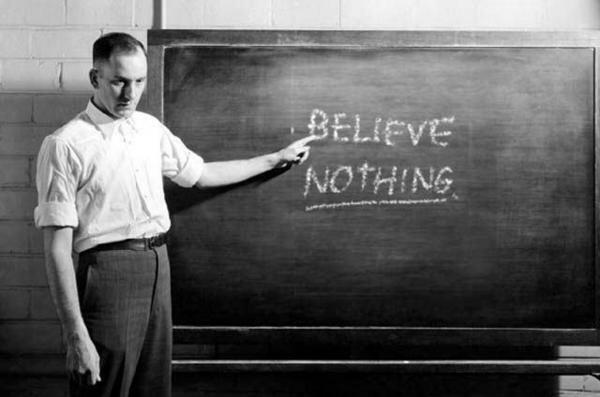 ..that believing in nothing is also a belief. I value that little phrase "I don't know" so highly. It's small, but it flies on mighty wings. our tiny Earth hangs suspended. i prefer "question everything". but then, who am i to say so? jstarr: "that believing in nothing is also a belief. Damn!" Hehe. Good one. I meant, I believe it's a good one, another belief. Duh! 20 May 2007 @ 20:03 by Sean Pion @67.48.249.151 : "believe"
Believe nothing,...? Hmm....thats a bit of a oxymoron is it not. I mean how does one beleive nothing; you have to believe in something to believe in nothing. Is this not the truth the mere fact of believe is a belief. 9 Aug 2007 @ 06:12 by Raphael @137.132.3.12 : mm. Hey, could anyone, please, tell me where this photograph is from? (is there a story behind it? )Thank you.